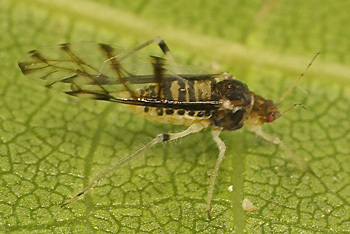 Panaphis are large distinctive aphids with short antennae only about 0.3-0.4 times the body length. All adult viviparous females are winged. The wings have the veins dark bordered with dark spots near the wing margin. The abdomen has dark marginal sclerites, broad dark bands across tergites 3-7, broken ones across tergites l - 2 and a small trapezoid sclerite on tergite 8. The siphunculi are short, truncate and without a flange. The cauda has an elongate oval knob. There are 3 described Panaphis species, all living on walnut (Juglandaceae). They typically feed along the midrib of the upper surface of the leaves. They are closely related and could perhaps be geographic variants of a single species. They have a sexual stage in the life cycle, but do not host alternate and are not attended by ants. Panaphis aphids can be a serious pest on walnuts. 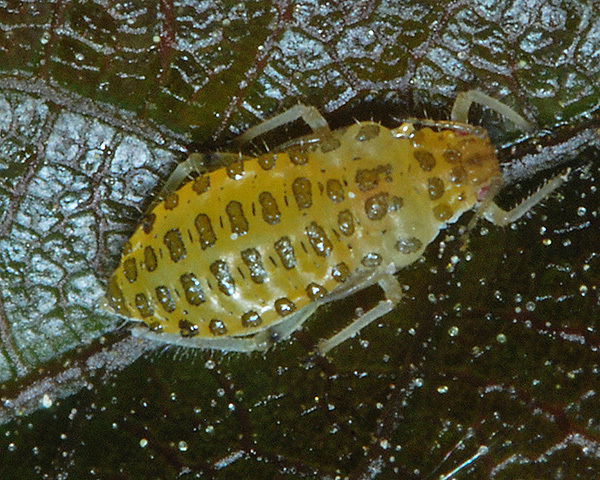 The fourth-instar nymph (see first picture below) has transverse rows of brown patches on the dorsal abdomen. All Panaphis juglandis adult viviparae are alate. The alate (second picture below) is large and stout-bodied. It has a darkened head and thorax, and a yellow abdomen with dark brown transverse bands. The forewing veins are fuscous-bordered. The siphunculi are short and truncate. The body length of the Panaphis juglandis alate is 3.5-4.3 mm. 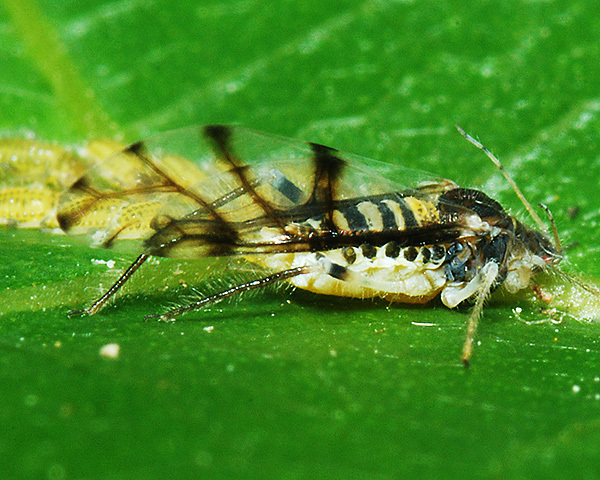 Panaphis juglandis live on the upper sides of leaves of European walnut (Juglans regia), in rows along the veins. They are not ant-attended, but ants may glean honeydew from the leaves. Sexual forms occur in September-October. The species is rarely found together with the small walnut aphid (Chromaphis juglandicola), apparently because Panaphis juglandis is adversely affected by the rain of honeydew from Chromaphis juglandicola. Panaphis juglandis occurs in Europe, and parts of central Asia, Pakistan and was introduced into the western USA. There is a large Walnut tree in the village with foliage partly hanging over the fence and above the footpath. I have been checking this weekly and today, at last, I found a single specimen of Panaphis juglandis - one I was especially keen to see! There can be no doubt of the id of this one I know but one image attached for the record! It was very active and I was chasing it for ages trying to get sharp images - still not completely succesful!